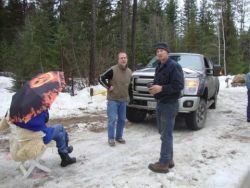 Any water-users, firewood gatherers, and other community members who maintain cultural relationships with the area who require access can contact Marilyn James or Taress Alexis at 250-226-6726 or Robert Watt or Dennis Zarelli Jr at the Sinixt Nation Bighouse at 250-226-6743 or email info@sinixtnation.org, and they will receive the combination. communications and until the concerns of the Sinixt Nation are addressed. The Licensee can obtain the combination for the gate when they come to remove their equipment.